Have you ever been to Mt. Hermon? I’ve seen it from the distance but only climbed (drove) up once. It’s amazingly far from most areas of Israel – far to the north, in the north of the Golan Heights and it towers above the rest of Israel. Security-wise, it is a vital element of Israel’s defense. Atop Mt. Hermon, it is very cold, freezing…much of the year. 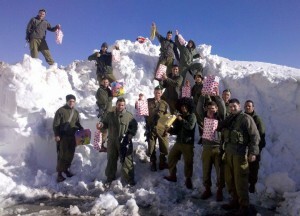 An amazing organization delivered Purim gifts (shlach manot) to the combat soldiers stationed there. They say a picture speaks a thousand words – this one does! And the amazing part is that all donations – every shekel or dollar donated, goes directly to the soldiers to buy them warm clothes, treats like the ones you see above, even basketball courts to give them exercise and fun during their off hours. They focus on combat soldiers, needy soldiers (buying them ovens, refrigerators, whatever they need) and on lone soldiers (visiting them, helping them, sending them special gifts). What these soldiers give to Israel cannot be measured. What Yashar Lachayal gives to the soldiers is a measure of comfort and thanks for their hard work. And what the soldiers give back to Yashar Lachayal and all those who donate to this worthy cause – can be seen in the smiles, the many letters thanking them for their tireless work. You can learn more about Yashar Lachayal and their amazing work on their website and you can follow them on Facebook!